Our first ten minutes in La Paz, we met Nelly and Xavier who were looking for the same hostel as us (and pointed us in the wrong direction). 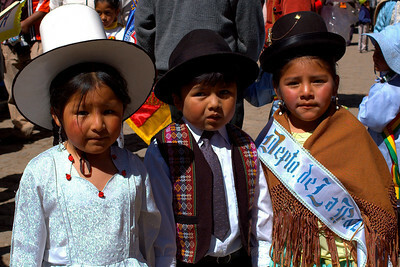 We ran into them later at Plaza San Francisco and made plans to head north for a trek in a few days. 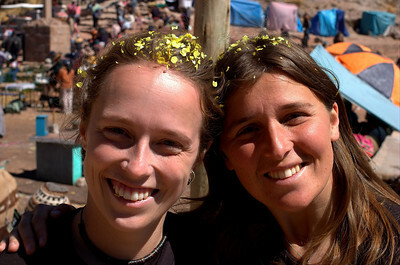 After waiting around La Paz for a few days, Nelly and Xavier became convinced (thanks to fellow travelers) that staying in Bolivia for the week of the referendum wasn't safe, and decided that they would head to the border with Peru. 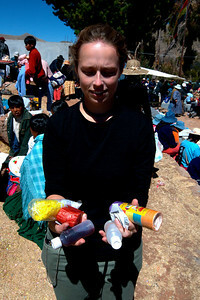 With no trekking companions, we changed our plans and joined them for their trip to Lake Titicaca. We ended up in the lakeside town of Copacabana at its busiest time of the year. 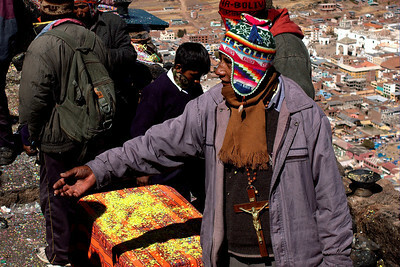 The Bolivian national holiday and the annual pilgrimage to the virgin of Copacabana occur in the first week of August. Travel to Copacabana during this week is not recommended, due to high risk of theft and violence against tourists. Local authorities had posted warnings in all hotels and restaurants telling us not to go out after dark and not to carry any valuables with us at any time. By the time we found our hotel room (thanks to Nelly's Spanish negotiation skills) it was dark, and we were hungry, so we ignored safety tips and headed out for dinner. We ate lake trout (not for the last time) and ran into two Bolivian filmmakers that had been on the same bus as us from La Paz. Xavier and I were both interviewed outside the restaurant, drawing some excitement from the local crowds. 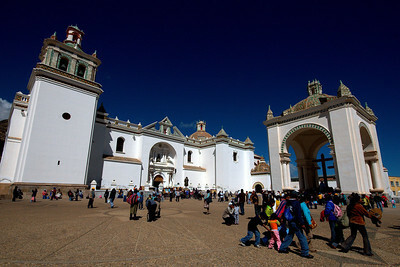 Small stands set up all along the main plazas of the small town, most of the activity was centered around the white-washed church of Copacabana, where little old ladies sold candles and plastic religious paraphernalia by day, and hard liquor by night. Home-made firework setups were put together for evening shows, during the day the local school children paraded around in ornate costumes accompanied by brass bands. 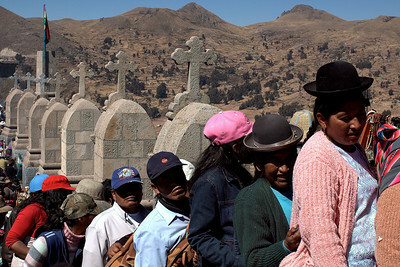 In the afternoon we followed the crowds of Peruvian pilgrims as they hiked up to the top of a local hill to pay homage to the Virgin Mary that looks out over Lake Titicaca and Copacabana. 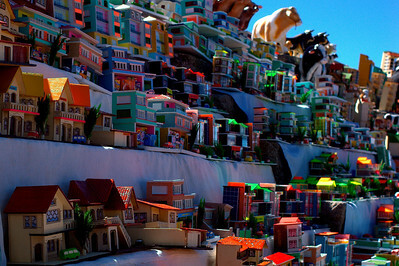 On the stairs leading up to the virgin, dozens of vendors set up their displays of miniatures. Wishful pilgrims pick out various objects that they hope for in their lives; houses, cars, trucks, livestock, money, university degrees (the poorer the pilgrim, the fewer miniatures they can afford). 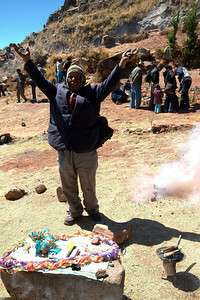 Nelly agreed to take part in the ceremony, and our shaman proceeded with a lengthy ritual of chanting and gesturing. He was disappointed by our lousy pile of miniatures (two packs of money) but encircled them nonetheless with the streamers and doused them with holy water. Our shaman stumbled slightly on the grand finale, when he opened up his arms to the sky, expecting the firecrackers to go off at the same time. After three or four increasingly frustrated attempts at simultaneous arm raising and firecrackers he eventually got them to go off and concluded the ceremony by covering us in confetti. 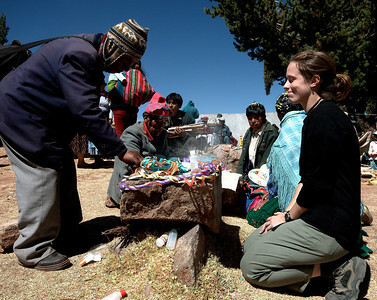 Dozens of these ceremonies were going on all around us (including the ritual of shaking up the bottles of beer and covering the altar and each other with beer, then letting the shaman drink up the rest). We continued further up the hill, past the queue of hundreds that were waiting to have a glimpse of the Virgin Mary statue. All along the stairs, people waited with offerings, and shamans performed ceremonies. 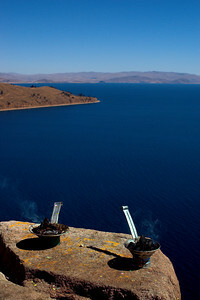 People ate and drank, and played music with the amazing Lake Titicaca in the background. And we were quite pleased to have seen it all. Do you have that Shaman's phone number or email address?